On the 05 June 2017, our admin team ( Ina, Paige, Ailbhe, Simona, Jennifer and Clare) participated in the VHI Mini Marathon. The Vhi Women’s Mini Marathon is known as the biggest all women’s event of its kind in the world. It began in 1983 with almost 9,000 participants and increased in 2014 to a staggering 41,006 women participating. This event has grown as women’s interest in their own health and vitality has developed over the last three decades. Indeed, it is not only women who have benefited from the event, but the charities are also the big winners. In 2016 it is estimated that almost €6m was raised by the participants bringing the total since the race started in 1983 close to €203m. All charities benefit as it is the women themselves who decide who they will support and many local causes gain vital revenue from the event. It is now the biggest single day charity event in the country. 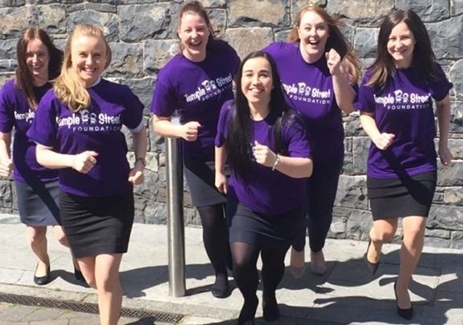 We have raised €686.22 for Temple Street Children’s University Hospital.